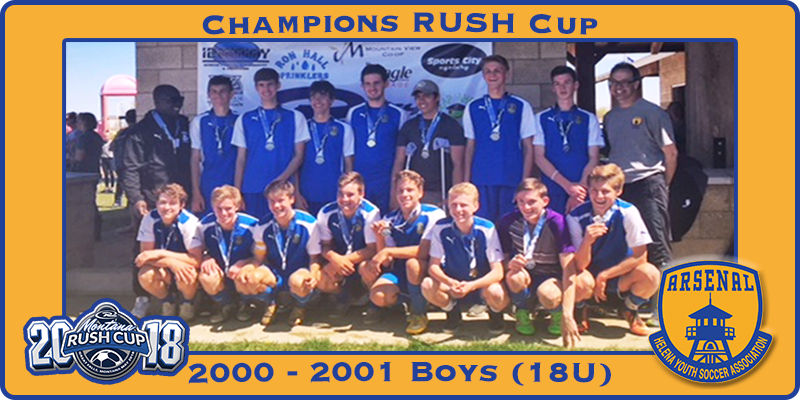 The Arsenal 2000-2001 18U Boys team coached by Charley Ayidomiho won the Great Falls Rush tournament over Mother’s Day weekend. The team outscored their opponents 12-1. Nine of the tournament goals came on combination work between Jackson Keller and Ben Ries-Roncalli. Cameron Wilcox and Trevyn Roth both came out of the back to each put in a goal for the Arsenal team. Jonah Bibeau scored in the championship game to give the team some breathing room and secure the championship with a 3-1 win over Great Falls. Kelson Demmons and Shawn Traynor shared time in the goal.